Looks: Tall and handsome. Has a thing for formal wear. Personality: Early on, acts cynical and callous to cover his insecurity over his missing time and contradictory feelings. When not pressured from outside is gentle and loving. Cooking: He can, at least enough to feed himself. Fighting Skills: Decent. Knows single-stick moves, but prefers to hang back and encourage. Special Abilities: Able to pull magic roses out of thin air, magic walking stick, great at appearing out of nowhere and returning there afterwards. Competition: Usagi, Rei, Queen Beryl. Queenie's dead, and Rei backed off when Usagi came into the picture. 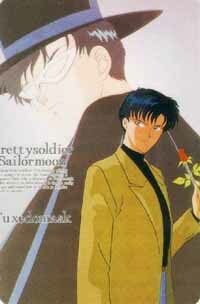 Usagi's the main problem as they are *destined* to be together. But they don't have to be together immediately, so pull the "I've got soap opera disease and will die in plenty of time for you to fulfill destiny" ruse. Economics: Modelling seems to have paid well, doesn't it? Still, he'll probably have to get a regular job until his King of Crystal Tokyo gig starts. Overall: Like many of the really good men, taken; but such a romantic!